During the five days of the offensive which had started on the Eagle Day, the Germans were probing for gaps in the British defences – constantly experimenting with different modes of attack, altitude, times, strength and approaches to their targets. On 18 August, the German Valhalla surged back over England in great numbers, this time concentrating on two sector airfields, Biggin Hill and Kenley. It would seem that at last the German intelligence had become aware of the elaborate function that the sector airfields had in the British system of command. In the early afternoon, as fair weather of the morning started to give way to the clouds, a formation of nine Dornier Do 17s of KG 76 led by Leutnant Lamberty set course over the Channel for a tree-top level attack on Kenley. Simultaneously, another group of about fifty Dorniers escorted by Bf 109s was to attack the airfield from an altitude. Lamberty’s Dorniers raced over the Channel skimming over the waves. They crossed the coast near the great beacon of Beachy Head, then continued continued inland at a minimum height, cutting their way between the rolling hills, their slipstream leaving a broad, flowing swathe across the fields of ripe wheat and barley. They zoomed past East Grinstead, making the final course adjustment. A flock of silver dots emerged over the horizon – the barrage balloon over London. At Kenley, the sector controller had sent two Hurricane squadrons to intercept. No. 64 for the high raid over base, and No. 111 towards the low raid. Both units made contact with the enemy, but No. 111 found it impossible to find a suitable position for attack at such a low altitude. Either way, the Dorniers were now almost over their target. The anti-aircraft gun crews were taken by surprise as the raiders rushed past their emplacements, and did not open fire before they already started dropping their bombs. More alert were the operators of PAC (Parachute and Cable) launchers – a highly unusual anti-aircraft weapon which was about to make its combat debut. PAC consisted of a small rocket trailing a steel cable, which shot vertically 300-400ft into the air and then descended on parachute. The rockets were grouped in batteries of nine, to be launched simultaneously in a curtain pattern. The idea was that of creating a web of steel cables across the path of a low-flying aircraft, causing it to catch the wires and stall to the ground. The parachute had a dual function. Once the rocket burned out, the canopy slowed the cable’s fall, allowing the “curtain” to stay up in the air for a longer time. Secondly, if the cable caught a bomber’s wing, the added drag from the parachute was hoped to be sufficient to foul its flight. There was also a smaller parachute at the lower end of the cable designed to balance the drag of the first one and thus prevent the cable from it from sliding off the wing of the aircraft. Later versions had an additional explosive charge hung at the bottom of the cable, intended to detonate on contact with the aircraft. “(…) the trade we had volunteered for was PAC Operators – Parachute Assisted (sic – Ed.) Cables. When we first heard the word ‘parachute’, we associated it with what the airfield was being used for, which was parachuting agents into occupied France. We thought, ‘what have we let ourselves in for’. But soon we were reassured. Parachute and Cable was a form of airfield defense against low flying intruder aircraft. It consisted of electrically fired rockets and cables. When fired the rockets fired to a height of 70-80 feet, carrying a length of cable coiled in a drum alongside. Having reached its full height the rocket head exploded releasing a parachute some 6 or 7 foot diameter suspending the cable vertically. If the leading edge of an attacking plane struck the cable, another parachute housed in a container at the bottom end of the cable deployed and the theory was that the resulting pull of the two parachutes, would cause the plane to crash. A typical layout was 20 rockets in three rows. Miraculously, this quasi-medieval weapon worked this one time. Announced by raising columns of smoke, the PAC web emerged right in front of the German bombers. One of the cables cut off part of the left wing of Lamberty’s aircraft. In a matter of seconds, the wing caught fire and the pilot executed a hasty forced landing. The stricken bomber bounced off the ground several times, coming to an abrupt halt in a hadge. The pilot of another Dornier managed to take evasive action by going into a steep bank to port in order to avoid the smoke columns. His port wing contacted one of the cables, but the wire slipped away without doing any harm. During the same few seconds, the Dorniers delivered their bombs with alarming accuracy. Another Dornier was shot down by Bofors gunners. In no more than ten seconds, the bombers disappeared, as quickly as they emerged, in the direction of Wattenden Arms, a pub located at the North-West boundary of the airfield which was said to be favourite with Kenley pilots. Curiously, one of the machines left the formation in a broad arc and returned, commencing regular circles round and round the airfield. Its pilot was killed, having received a bullet in the heart, and his body jammed the controls. The bomber circled aimlessly for a while, attracting a great deal of AA fire. 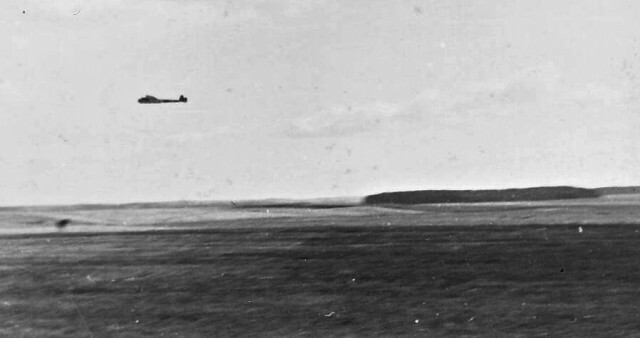 Then, as the crew managed to pull off the body of the dead pilot at take control of the stricken aircraft, it had straightened its course and departed after the others. All but one hangars at the Kenley aerodrome, grouped along its Southern boundary, received direct hits. Practically all of the station’s other buildings – the station headquarters, the ops room and the officers’ mess among them – were either destroyed or damaged. Six Hurricanes were wrecked on the ground. But this was not to be the end of it. In another few minutes, a uniform roar of the high-level raid rose over the crackle of fires. The second wave of attack was arriving late. New bombs fell, multiplying the damage already done. Ten hangars were reduced to rubble, six other severely damaged. The concrete runways were riddled with craters, additional aircraft destroyed. The equipment stores became write-offs. The station’s hospital was in complete shambles; its medical officer died in an unfortunate direct hit on a shelter trench. Eight other people were killed and ten injured. Fires were raging everywhere, but there was no water or electricity to help extinguish them. All communications were severed. The sector operations room at Kenley had ceased working. Before the sunset, a lone WAAF sergeant could be seen walking across the airfield with a bundle of flags under her arm. Once in a while she stuck one of her little flags into the ground, like a caddy marking out a golf course. Her task was to mark unexploded bombs. Hurricanes of No. 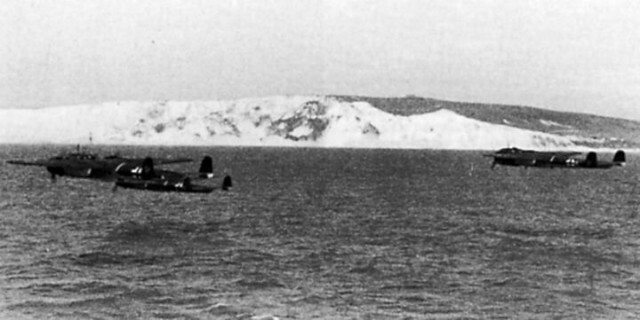 64 Squadron returned the same evening, landing on a clear strip between the craters. On the following day, the vital sector operations room was working again from a disused butcher shop – Spice and Wallis in nearby Caterham. Lamberty’s Dornier remained the only aircraft ever destroyed by a rocket-propelled spider web.